Coming from the M50 take the Tallaght Exit (Junction 11) and head towards the N81 (following signs for Blessington). Continue straight through all roundabouts (passing Tallaght village on right and Maldron Hotel/Tallaght Stadium on left). Continue straight on the N81 following signs for Blessington. Pass straight through Blessington village continuing on the N81. After about 17 miles you will see a pub called the Olde Tollhouse on your left. Continue straight past this and keep an eye out (on the left) for a brown heritage sign to the Dwyer/McAllister cottage. Continue up this hill following the road and signs for Dwyer/McAllister cottage. 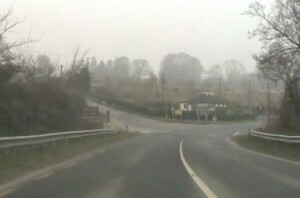 You will come to a village called Knockanarrigan (sign posted) and a crossroads (with a shop on the left). Turn right at this crossroads (see image below) (still following the signs for Dwyer/McAllister cottage). where you pass a cemetery on your left. 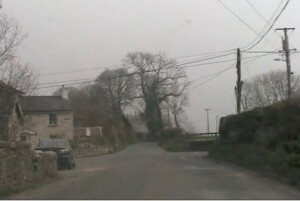 You will then see a white farmhouse on your left (situated lower than the road). Approach slowly as within about 60 yards (on the summit of the hill) you will see a sign for ASH ANIMAL RESCUE and a lane to your right which you must take. (see below). You’ve made it!! Please drive into the car park at the bottom of the lane on the left and come on up to the cottage when someone will come out to meet you. On the N11 (direction Wexford) drive through the Loughlinstown roundabout (bypass Shankill/Bray). Continue along the M11/N11/M11 and take Exit 16 (signposted Wicklow/Rathnew). At the roundabout on top of the slip road take the first exit left towards Rathnew (R772). Then at the next [mini] roundabout (direction Rathdrum – R752/R772). You will pass through Glenealy and bypass Rathrum. Then about 2.5km after Rathrum you will see a right turn signposted for Carlow/Aughrim. After about a mile you come into Ballinaclash. Turn right across and over the bridge and then immediately left. This road will bring you into Aughrim. 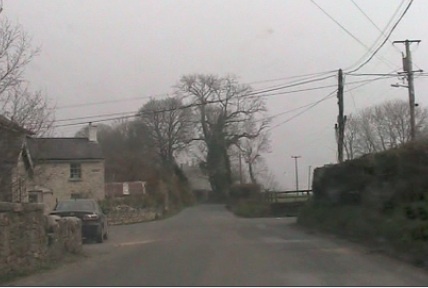 In Aughrim, just after the shops and at the main crossroads go straight ahead (you have to give right of way as you are crossing the main road). 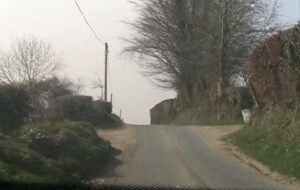 Now, at the end of town you have to take a right turn, direction Kiltegan (straight goes to Tinahely). It is a winding road. After 3 miles you pass Cappagh Nurseries. It is another 8 miles to our house now. The road forks 3 times – each time chose the right fork. 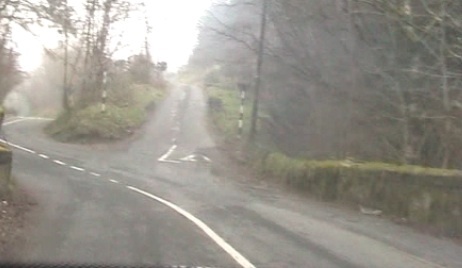 Once, in a sharp bend to the left, there is a road going sharply right, direction Glenmalure, ignore it. Never leave this road until you come into Rathdangan. It is small village, so don’t pass through it. At the crossroad in Rathdangan take the right turn which leads uphill. After about half a mile from the village you will pass a yellow bungalow on your right and then you should start to keep an eye out to your LEFT when you will see signs for ASH. Turn left up this lane and into the car park just to the left. Our cottage is up that lane to the right. Please come on up to the cottage door – someone will come out to meet you. Alternatively you could follow the signs for Glendalough, in Glendalough you turn left direction Woollen Mills, go past the Mills and when you have gone over the bridge you turn right for GlenMalure, at the x-roads in GlenMalure you cross straight over and that will bring you to the Aughrim-Baltinglass road, about 8 minutes away from us. Never leave this road until you come into Rathdangan. It is small village, so don’t pass through it. At the crossroad in Rathdangan take the right turn which leads uphill. After about half a mile from the village you will pass a yellow bungalow on your right and then you should start to keep an eye out to your LEFT when you will see signs for ASH. Turn left up this lane and into the car park just to the left. Our cottage is up that lane to the right. 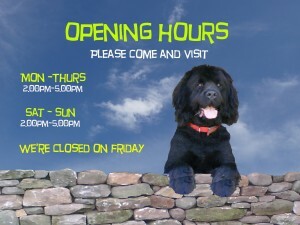 Please come on up to the cottage door – someone will come out to meet you. to the left after you pass the hospital and keep on that road until you come to a T junction, where you take a right. bungalow on your right, you will see a lane on your left. from New Bridge to Kilcullen, to Dunlavin, at the T-crossing turn left, this road forks twice, each time you choose the right hand fork. When you come to the N81 T- crossing turn right – soon after you will see a brown heritage sign on your left, it tells you to take a left turn for Dwyer- McAllister Cottage, which you will do. You will pass a few sawmills, The Glen Lounge, Coolmoney camp (armycamp) just past it you drive into the tiny village of Knockanarrigan. You will see a shop/petrolpump/postoffice on your left. At that x road you turn right, there is a small sign pointing to Dwyer/McAllister, the road forks twice, follow sign for the cottage, after a few miles you will pass the cottage, 1 mile after that there is a sharp bend in the road to the left, inthe bend the road forks, you choose the right fork, in is narrow and goes uphill. We are on this road a few miles further, first you go through the forest, then you will pass the graveyard on your left, a new house on the right (slightly up the hill), then you will see a working farm on your left, many farmbuildings and a 2 story house, our lane is just past it on your right. It is about 3 quarters of an hour’s drive. hospital, so you turn left at the supervalu, this road will bring you to Ballymore Eustace, in BmreE turn right at vivo supermarket, right again at T-junction, this road will bring you out to the N81.When you come to the N81 T- crossing turn right – you will pass a pub called The Olde Tollhouse,soon after you will see a brown heritage sign on your left, it tells you to take a left turn for Dwyer- McAllister Cottage, which you will do. You will pass a few sawmills, The Glen Lounge, Coolmoney camp (armycamp) just past it you drive into the tiny village of Knockanarrigan. You will see a shop/petrolpump/postoffice on your left. At that x road you turn right, there is a small sign pointing to Dwyer/McAllister, the road forks twice, follow sign for the cottage, after a few miles you will pass the cottage, 1 mile after that there is a sharp bend in the road to the left, inthe bend the road forks, you choose the right fork, in is narrow and goes uphill. We are on this road a few miles further, first you go through the forest, then you will pass the graveyard on your left, a new house on the right (slightly up the hill), then you will see a working farm on your left, many farmbuildings and a 2 story house, our lane is just past it on your right. It is about an hour’s drive.